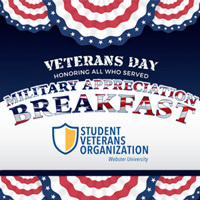 Webster University’s Student Veterans Organization (SVO) will host the 7th annual Military Appreciation Breakfast on Monday, Nov. 12, from 8-9:30 a.m., honoring the military service of Webster students, faculty and staff. Veterans and current military members are invited to enjoy a free breakfast at Marletto’s Marketplace, along with camaraderie and fellowship with the SVO members. Please check in with the SVO hosts for a breakfast voucher upon arrival, and redeem for a custom cooked-to-order full breakfast. Sunday, Nov. 11, is Veterans Day, the official day for Americans to pause and recognize all U.S. military veterans for their great service to our country.